This is my second year to use Class Dojo, a free online behavior management tool. I love that it is easy to set up, engaging for the students, and customizable. There have also been some neat little features added recently, which makes it even more awesome! Since Class Dojo can be used in a variety of ways, I thought I'd share how I use it in my classroom. If you've never heard of Class Dojo, check out the Student Introduction Video that I showed my class during the first days of school. I award more positive points than negative, and this class is so well-behaved that I didn't have to check a single "Needs Work" behavior until the end of the 3rd week of school! I think that's a record! As of now, my students have around 40-50 points each. 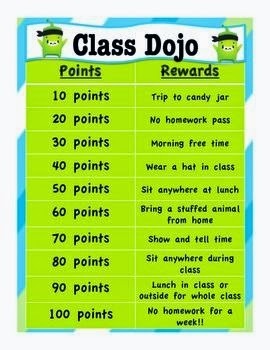 At the end of the nine weeks, we will turn our dojo point values into Dojo Dollars and hold a Class Auction (similar to past years). When students reach 50 points, I give them their "Secret Code" and they are allowed to change their avatar. Parents are able to check their child's progress at any time, but each Friday, Class Dojo emails the parents reminders to view their child's behavior progress report. Also, if you need to share information with a parent via Class Dojo, there is a messenger feature that's been added recently. I feel that Class Dojo holds my students more accountable for their behavior. Parents are able to see, in real-time, their child's progress, and it's been so much easier to discuss behavior with the parents. Last year, when I started using Class Dojo, I had a parent ask me at dismissal, "Why, exactly, did my child lose a behavior point today?" I honestly couldn't remember, and I admitted that! I turned to the child and said, "Tell your mom why you lost a point." He was able to say, "Well, I did..." This took the burden off of me and put it onto the student (where it belongs). My students are old enough to be able to explain their actions. And they can remember situations better than I can at times! Class Dojo has made it easier for me to manage behaviors in my classroom and report to parents. It is fun for the kids and simple for me to use. Because this system is web-based, I can use it on my laptop, phone, or tablet; it's so versatile. I would definitely recommend Class Dojo to any K-6th grade teacher.